The scaphe had at the bottom a compass (missing) with the indication of the cardinal points 'SEP:', 'OR:', 'ME:' and 'OCC:' engraved on the brass in a circle around the compass. The gnomon, which appears to be a modern replacement, is inclined for 48? latitude, as indicated by the inscription on the border of the scaphe 'POLVS GRA: 48'. The dial indicates common hours marked IIII to XII to VIII, Italian hours marked 9 to 24 and the declination of the Sun by the symbols of the zodiacal signs. On the border of the scaphe is also the signature 'GEORGIVS HARTMANN NOREMBERGE FACIEBAT ANNO 1539'. 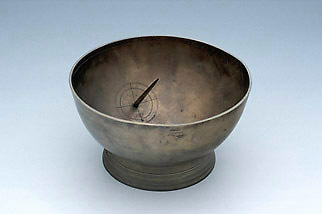 The instrument is in brass and has traces of gilding on the inner surface.